Premier Li Keqiang's planned trip next week to European Union headquarters and Croatia is expected to enhance global governance and build an open world economy while promoting political trust with European countries, a senior diplomat said on Wednesday. The premier will begin a five-day trip to Europe on Monday, for the 21st China-EU leaders' meeting in Brussels, capital of Belgium, and the eighth China-Central and Eastern European Countries leaders' meeting in Croatia after making an official visit to the country, according to the Foreign Ministry. The trip will be Li's first overseas travel this year. It is another high-level exchange between China and Europe, following President Xi Jinping's visit to Italy, Monaco and France last month, It shows the great importance China has attached to its ties with the continent, said Vice-Foreign Minister Wang Chao, who oversees China's ties with Europe, at a briefing. The premier will hold talks with European Council President Donald Tusk and European Commission President Jean-Claude Juncker, before meeting with journalists at EU headquarters next Tuesday, Wang said. It will be Li's fifth time attending the annual event. China and the EU, which share common stances over multilateralism and free trade, will sign a number of agreements to boost ties in energy and other fields, Wang said. China supports the integration process of Europe and sees the EU as a vital strategic partner, he said. Li's visit is also set to boost cooperation with the regional bloc in major regional and international issues such as climate change and sustainable development, and to strengthen coordination in World Trade Organization reform and the G20, Wang said. The premier's trip is also expected to promote pragmatic cooperation with the EU in trade, investment, technological innovation, finance and national defense, the vice-minister said. The visit is planned to better align the Belt and Road Initiative with the EU's development strategies and improve connectivity, he said. The premier will then head to Croatia and attend the eighth China-CEEC leaders' meeting in the coastal city of Dubrovnik. His visit will be the first to Croatia by a Chinese premier since the establishment of the two countries' diplomatic ties. Since the launch of a cooperation mechanism, China's trade with the 16 Central and Eastern European countries has seen steady growth, hitting $82.2 billion last year, according to figures from the Foreign Ministry. 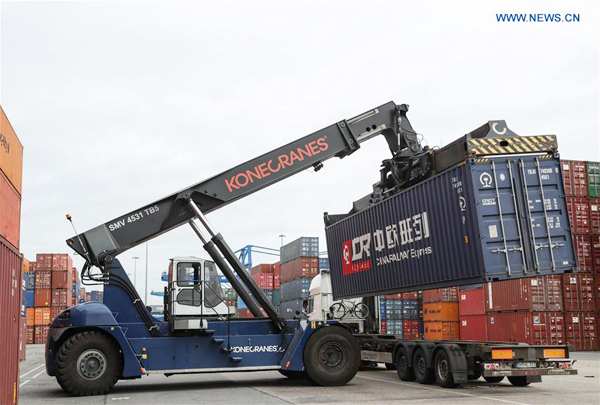 China's imports from the countries rose 24.6 percent year-on-year in 2018, which analysts considered a significant increase given the global trade slowdown. Wang said China does not seek to split the EU but aims to help promote more balanced development of European nations through its cooperation with Central and Eastern European countries.